If it wasn't for the Romans and the Greeks we probably would still be taking a cold shower. Our modern baths originated from the Roman Thermae or hot baths. The hamman is probably the oldest surviving bath tradition in the world. What can be better than coming home in the evening and having a relaxing time? Or to pamper yourself on a Sunday without going to a spa. What comes to our mind when we think of wellness? Wellness is generally used to describe a healthy balance of the mind, body and spirit that result in a feeling of well-being. So let us see how we can turn our bathroom into wellness. Free standing bathtub, big mirror, bathrooms do not have to be a "cold" environment. Free-standing bathtubs come in all kind of materials: cast iron, stone, acrylic, and composite. When you recognise that a free-standing bathtub has to be well finished on the inside as well as on the outside, you will understand immediately that this type of bathtubs are more expensive. The beauty of a cast iron bathtub is that it can be finished on the outside with another colour, or even another metal. 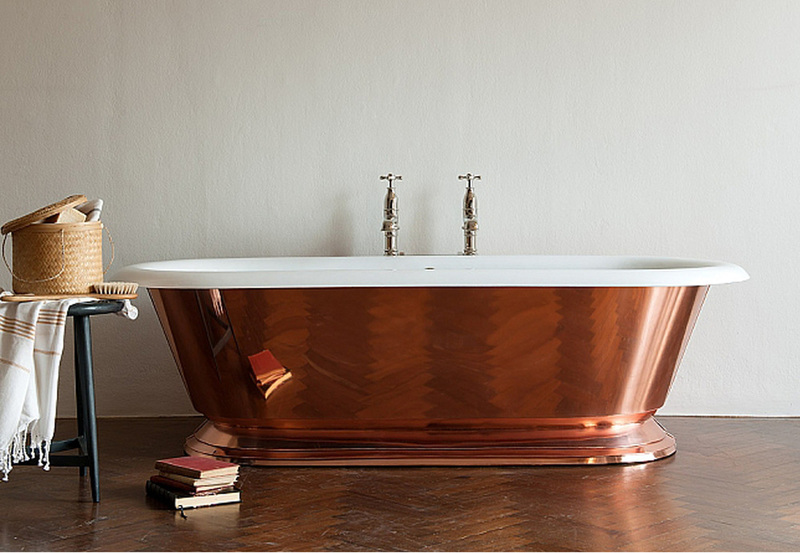 This bathtub of Drummonds has been wrapped in sheets of copper, hand-pressed on to the raw cast iron to give it the durability of a cast iron bathtub, but with the look of a traditional copper bath. The copper can be polished and lacquered to retain it's shine or left unlacquered to allow a natural copper patina to develop as it ages. Serge Volevatch of Russian origin had an excessive taste for French culture. He started in the 1970's to restore some splendid components that were found at a flea market and were doomed to disappear. After Rudolf Nureyev commissioned him to design a complete bathroom in 19th century French style, Serge Volevatch fully launched himself into the restauration and creation of exceptional bathroom fittings and fixtures. The Bistro serie of Volevatch is marked by a certain nostalgia for the great period of Parisian culture. This collection respond to a very contemporary trend of handsomely crafted classics. The details of the faucets are designed with exceptional care. There are choices out of 10 metal finishes, and in combination with several semi-precious stones. They can be ordered on measure. Give your bathroom a stylish look. Add some flowers or plants, beautiful bottles of shower gels and perfumes. Put some extra attention to this room. Decorate your bathroom as you would the living area and your bedroom. Surround yourself with luxurious bath towels, find a place to have them convenient to where they are needed. Place them on a shelve, or on a small stool. Invest in attractive towels with a dense weave of organic cotton and a weight of not less than 600 gr/m2. Organic cotton is grown without the use of any synthetic agricultural chemicals such as fertilisers or pesticides. Organic cottons are as gentle on your skin as it is on the environment. Towels can also bring a touch of colour to a neutral bathroom. Choosing the appropriate beauty product with natural ingredients is a part of the wellness lifestyle. 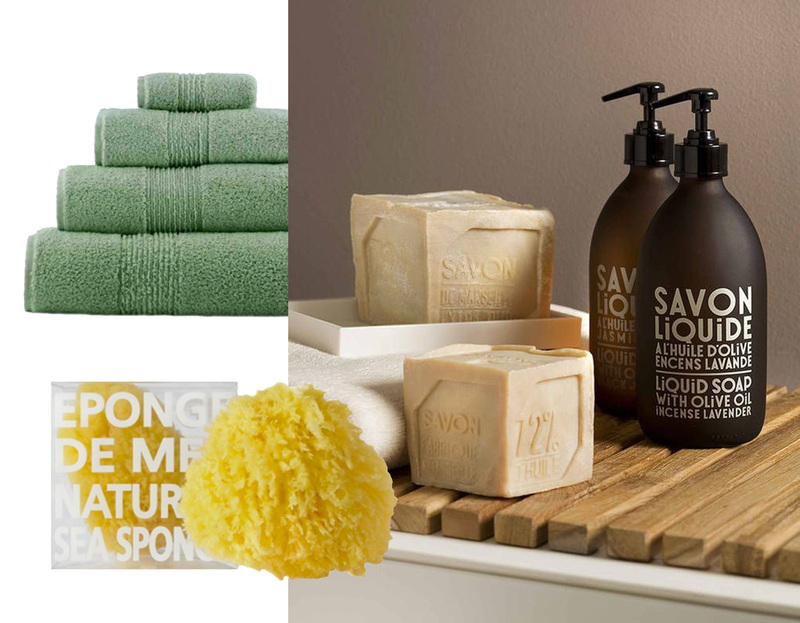 Marseille soap is rich with history, and has become a piece of heritage as a symbol of the city of Marseille. Shower gels, body milks with natural ingredients to cleanse and soften the skin are available in a variety of refined fragrances for both men and women. Zellige, is a handmade coloured terra cotta tile with origins in the ancient Mediterranean and the Middle East. They are handcrafted from unrefined white clay and glazed. The exquisite Zellige tiles have a unique irregular finish, the colours vary subtly in depth and reflection with their translucent glaze. They are widely used in Morocco in very elaborated, multi-coloured mosaics as real works of art. They have wonderful effects in their simple square shape that enable them to be appreciated in infinite variety of colours created by the use of an artisan technique that gives them more live than industrial tiles. A simple wall in the bathroom becomes precious. Jonas Shower, a little reminder of the "Baignoire Delirante" times; the beginning of Volevatch in the 70's. This sculptural shower, aside from a beauty and work of art, is a promise of a new sensory experience - the extreme privelege of finding yourself pampered by the water's caresses. Tadelakt is a traditional product that produces a natural wall finish. 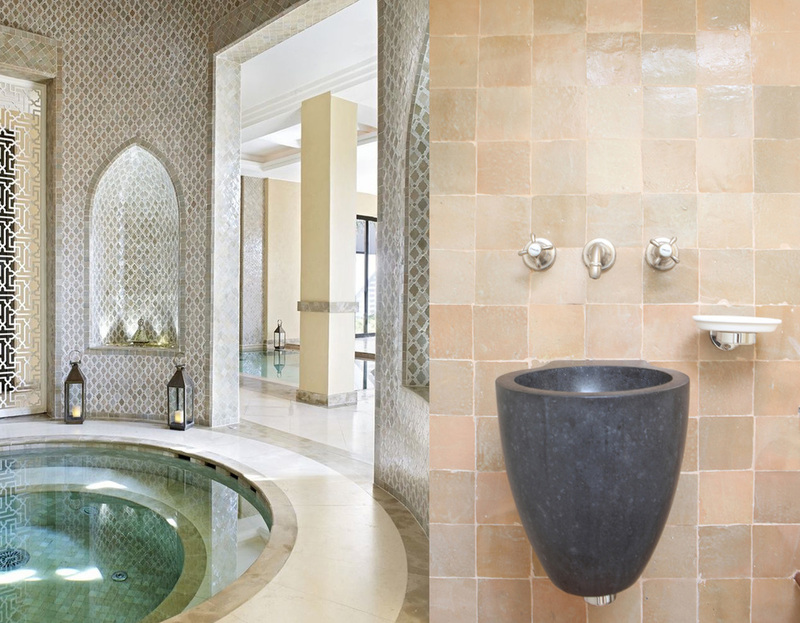 If you visited Morocco you may have noticed the shiny plastered walls in the palaces, hammams, and bathrooms. These walls have been made by the traditional application of a lime plaster to the wall then polishing the walls by hand with a stone and finishing with a soap mixture for its final appearance and water resistance. The process is labour intensive and time consuming. The method gives you a natural appearance and produces a waterproof finish. This traditional finish goes way back to the days when there were no shower cabines as we know them now. Linen towels are an alternative to cotton towels, they are most of the time flat woven, come in natural colours. There are also very elegant hand knotted towels with a jacquard weave. Linen is one of the most ancient fabrics known to man. It has several advantages over other natural fibres. One is that it is stronger than other fibres and can absorb over twenty percent of its weight, much more than cotton. Linen ages gracefully, the more you use it the better it looks and feels. Wellness is more than quick taking a shower. Scrubs and bath salts are Benificial in making our skin soft; they improve the absorption of body lotions and body oils. We can go back to ancient times. The Egyptians were practising exfoliation, hundreds of years ago. This was also common in Asia. They are often mixed with essential oils, to enhance our complete well-being. A healthy spirit creates a healthy body. 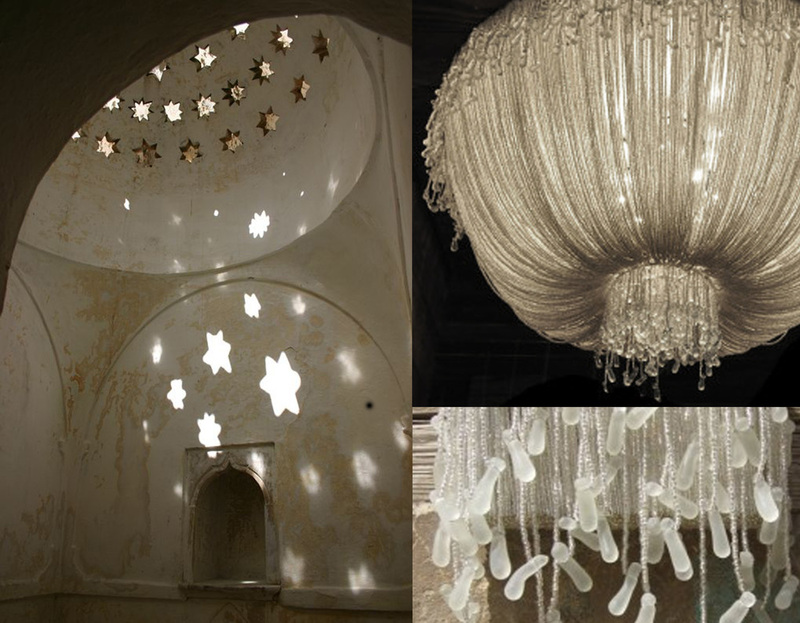 A visit to a Turkish hammam will immediately reveal the half-light. It is as you come in another world, you will forget all the distractions which you left behind the door when entering the hammam. Use candles to light the room, wall lamps or ceiling lamp where you can temper the light create the atmosphere where you can relax and dream away. The earliest candles originated in China around 200 BC. They were made of whale fat. Before the invention of electrical lighting candles were used for illumination. Today, candles are used mainly for aesthetic purposes and scent that creates a soft and warm ambiance. Scented candles are used in aromatherapy, they transform your space into a refreshing and relaxing haven. Regardless of the stage of the creation of your bathroom, choosing the tiles for the walls, the colours, or just adding some decoration, you can create you own spa at home.